Symptoms of breast cancer are often subtle changes in your breast. This is why it is important to know what your normal breasts look and feel like. Changes are more noticeable when you practice self breast exam regularly. Most breast changes are not caused by cancer, but don’t ignore them. Schedule an appointment with your provider. With screening and diagnostic procedures, your provider can determine whether you need further treatment or are good to go. Your breast cancer treatment plan is one of the first steps on the path to healing. 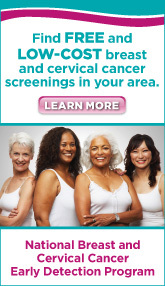 Your cervical cancer treatment plan is one of the first steps on the path to healing.